The atrium is an all-weather, glass-walled plaza with trees and flowers. Come rest in the atrium to relieve your tired feet from walking around Goryokaku. Take time and relax in a green environment under the sun. Various events are held in the atrium throughout the year. Hakodate when Goryokaku was built. There is Food & Drink 107 inside the atrium. Its popular menu is freshly baked gipfels. Gipfels mean mountaintop and the highest summit in German. In Switzerland, gipfels are widely known as croissants. Food & Drink 107 offers butter gipfels, anko gipfels, chocolate croissants, and many other breads. All the breads are baked fresh in the oven inside the cafe for visitors to enjoy freshly baked goods. The cafe also offers tasty soft-served ice cream made using local ingredients, Yamakawa Milk, coffee drinks, soft drinks, and much more. 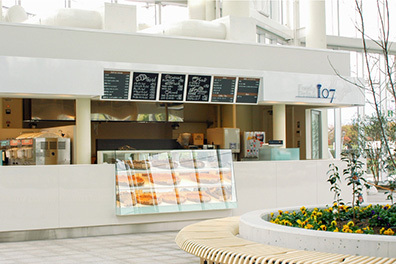 Please check the menu for the cafe inside the atrium. 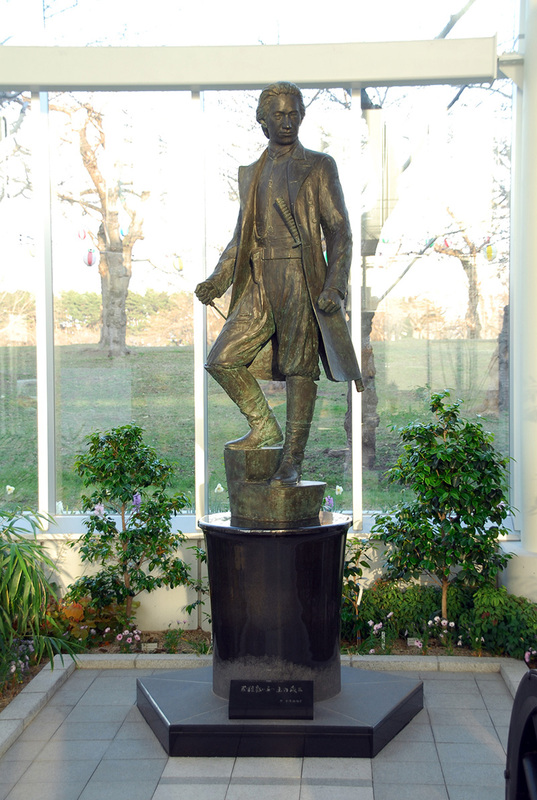 Next to the atrium stage is a bronze statue of Toshizo Hijikata, who served as the vice commander of the Shinsengumi, to symbolize his deep relationship with Goryokaku. His life appeals to many people and receives support even today. The statue was created by sculptor Machiko Kodera (1950-2012) who was born in Hakodate and active in Italy. Produced in December 2003 as part of the 40th anniversary project.See an enlarged photo. 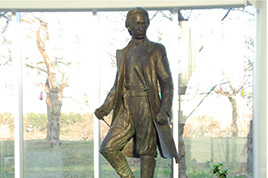 About the bronze statue of Toshizo Hijikata. Eco-friendly air conditioner, Dry Mist. 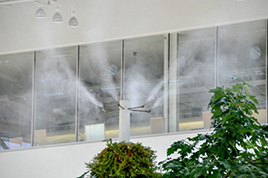 For the air conditioner of the atrium, eco-friendly Dry Mist powered by nature has been adopted. Tree leaves spray a small amount of water into the air inside the forest. The sprayed water evaporates immediately in the air to draw heat from the surroundings. That is why it feels cooler in the forest. Dry Mist also utilizes water evaporation to cool down surrounding temperatures to create the same coolness as inside the forest. This means it is an eco-friendly air conditioner that uses the power of nature. Dry Mist delivers the coolness of forests to the summer of the Goryokaku Tower Atrium. ● Dry Mist can lower the surrounding temperatures by two to three degrees. ● The energy consumption to lower temperatures is extremely small at one-twentieth of household air conditioners. ● Because water droplets are extremely fine and evaporate immediately, people do not feel wet even when they touch the water droplets. ● Dry Mist helps alleviate climate changes and the urban heat island effect.Related website: Promotional campaign for climate changes, Fun to Share. Goryokaku Tower is a smoke-free facility.